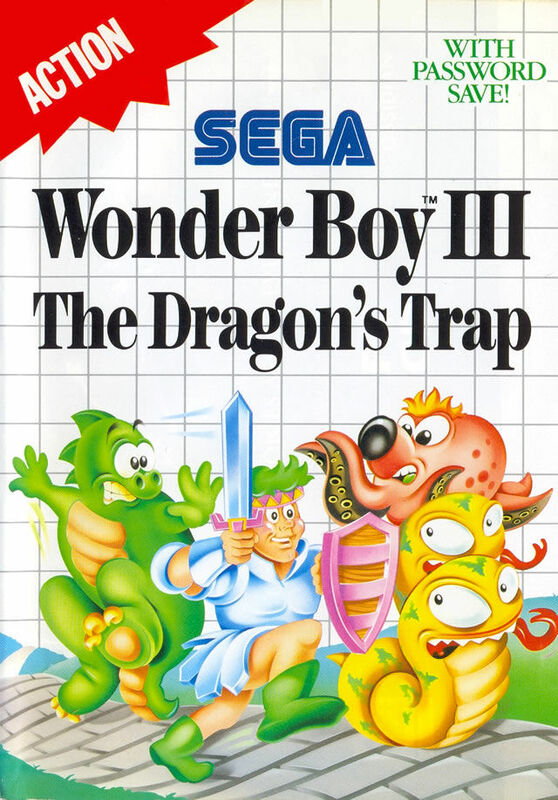 Wonder Boy III: The Dragon's Trap is a direct sequel to Wonder Boy in Monster Land. When Tom-Tom defeats the MEKA dragon, the wounded beast casts a spell on him, turning him into a Lizard-Man. To regain his original human form, he has to find the Salamander Cross, hidden by the Vampire Dragon in Monster Land. Unlike its predecessor, this side-scrolling platform game is not divided in sequences of levels. The protagonist is allowed to go anywhere, as long as he has the right shape or equipment. During his quest, Tom-Tom has to defeat various dragon bosses. Each win will give him a new shape with new abilities such as flying, swimming, walking on ceilings or clinging to walls. These abilities also allow the player access new parts of the world. The possible shapes are Lizard-Man, Mouse-Man, Piranha-Man, Lion-Man and Hawk-Man and the main abilities are defined by attacking power, defense points and charm points (needed for equipment by collecting charm stones). Also, certain blocks can only be destroyed by specific weapons or are only accessible to certain shapes. The basic actions consist of attacking and jumping, and in the status screen it is possible to equip swords, shields and armour. Special attacks include fire balls, tornadoes, arrows, boomerangs and thunder strikes. Along the way, the player collects keys (only one at all times) and gold left behind by defeated creatures, and places need to be re-visited sometimes to access new areas. Equipment and items can be bought in towns. A password is given at the beginning of each town to continue from there. The Game Gear version has minor tweaks to level layouts to accommodate the smaller resolution better. Prices of shop items have also changed. This game is damn difficult, as some other games from that era. So difficult that some could say that these games are either impossible to finish or that the gamers would simply give up. Even with having today the opportunity to save the game anytime we want, it is highly difficult. So imagine with only one or two lives. What is really interesting in the game is that the main character is under a spell and changes throughout the game. We start as Wonder Boy and then we are transformed into a dragon. What is great is that some levels require special ability only available to some later characters, such as the mouse. And what's really fun is that we can already see part of the game, for instance a special wall that we cannot jump yet. This makes for a really fun gameplay. The music of the game is really terrific. It is very catchy while having a je-ne-sais-quoi of oddness, working perfectly since the game is about the main character having a curse put on him. It's really one of my favorite game soundtracks of all time. A classic game. I give it 10 out of 10.